In April, The Body Shop will launch limited edition summer versions of 2009's Love Etc..., 2010's Dreams Unlimited and 1981's White Musk. Love Etc...Sun Kiss ~ featuring notes of bergamot, nectarine, neroli jasmine, sandalwood and amber. Dreams Unlimited Sun Fresh ~ with salty aquatic notes, watermelon, mandarin, neroli and orris. White Musk Sun Glow ~ with notes of lemon, peony, sandalwood and musk. 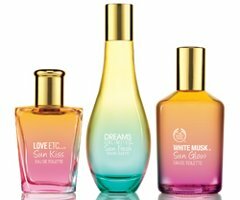 The Body Shop Love Etc...Sun Kiss, Dreams Unlimited Sun Fresh and White Musk Sun Glow will be available in 50 ml Eau de Toilette. They look really nice in a group like that. The Love Etc. one sounds kind of appealing (I have no idea what the original Love Etc. smells like, not that it particularly matters). I’ve discovered lately that I’m a sucker for peach notes, and I’m going to assume that nectarine is not substantively different. I would think they’re pretty similar in a perfume, yes! Both Love Etc. and the Sun Kiss White Musk sound appealing to me – I like Body Shop products, the store overall tends to be…overpowering sometimes, scent-wise. Still, these will be worth a sniff!